Swimming pool solar panels eventually leak. Ultra violet light damage and freezing temperatures often cause solar panel tube leaks. Leaks will be found in the small diameter tubes and where these meet the larger diameter upper and lower tubes. Use the following steps to repair leaks in solar pool panels. Identify leaking solar panels. Run the solar pool heating system to circulate water through the panels. Leaks will be seen as drip lines from the large upper and lower tubes. Leaks in individual channel tubes will be seen as a stream of water. Use chalk or nail polish to mark each leak. 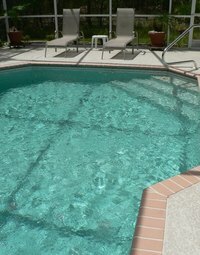 Turn off the pool pump and allow the panels to drain and dry completely. Identify the brand of solar panels you own. Search online for a solar panel repair kit that includes a tube cutting tool and tapered rubber plugs. For example, Fafco solar panels have their own affordable solar repair kit as noted in the Resource Links below. If you cannot find a repair kit, you can still make the necessary repairs. Use the cutting tool or a razor knife to remove a 1 inch long front section of the leaking tube near the top and bottom of the tube. Push a repair plug into the opened tube. The Fafco kit will provide a tool to push the tapered plug into the tube. You can also use a 1/2 inch long section of 1/4 inch or similar diameter threaded nylon bolt along with Liquid Nails glue. The plug is pushed into the tube in the direction shown by the arrows. If you use glue to help secure the plug, allow it to dry overnight.